It's Chicken Run at the Trick or Treat Trot. Apparently I'm really bad at wearing anything but my usual running outfit at a running race. The running outfit itself may change from year to year--a swapped tank here, a new pair of shorts there, and an added layer when necessary--but still, I'm hard to sway from my usual shorts/capris, tank, sports bra and pullover. And of course, my socks (unless it's a marathon) and shoes. Take last week's Homecoming 5K where runners were encouraged, told even, to wear gear sporting their alma mater. Me? I wear my usual #FFCheer tank and shorts, tossing arm warmers and a jacket in my bag in case I got cold (but thanks to overdressing on my bike ride to the race start, I was more than happy to lose the layers). Everyone else? Tees shouting Illini, Spartan, Go Blue, Dartmouth, Loyola and more. Shorts in what I can assume were college colors. A runner wearing a bright yellow apron that I can only assume was his way of sporting his college pride. Another runner who wrapped a Berkeley flag around his neck and let it billow like a cape as he sprinted with a jogger stroller with a future member of Cal's class of 2033. So where was my purple pride? Where was my Northwestern tee, or rather, one of my many NU tees that I collected over the years? Back at home, buried in the drawer outnumbered by the race tees. And my excuse? It wasn't made of technical material. Here I am worried over how uncomfortable I could be during the 20-something minutes of a 5K instead of representing my school, and being one of the four alumni at the race (if I counted correctly in the race results). Fast forward to yesterday's Trick or Treat Trot, a race that encourages Halloween costumes on the course and always has. Me? I wear my usual #FFCheer tank and capri tights (it was chilly! ), adding a fleece layer on top to keep the cold out. Many others? The costumes came out of the closet: an Angry Birds hat, a skier, a bride, a chicken. Wonder Woman told me I was hard for her to catch. And my excuse? I didn't want to run in a grass skirt--I learned my lesson when I wore it during a Spooky Spinning class--and I thought my ladybug wings would flap too much. It could be me, but I didn't need a costume, or a dress-up occasion, to have fun at those runs. In fact, I never have, even the painful ones. Or maybe I just got too wrapped up in putting my game face on, racing against the clock instead of racing against how long a costume would hold up. Or maybe I just got too superstitious and needed to wear my "running uniform" to have a good run--I didn't see any black cats, but you never know. But I'm trying to break this spell of failing to dress up. One problem: I still need a costume. And one that I can run and sweat in. I don't want to wear the costumes I've worn in the past for parties, costume contests and indoor cycling classes that fall on Halloween: a ladybug, a bunny and a hula dancer. 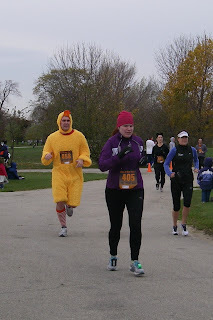 I couldn't pull off the fairy or postman looks I saw on this year's Chicago Marathon course. And I'm sure had I been at Saturday's Monster Dash or Sunday's Marine Corps Marathon, both so close to Halloween that costumes had to be plentiful, that I would have found some inspiration beyond the loose list I formed. With my mind being at a creative standstill in the costume department (my sister is the costume genius, not I), I'm begging runners to chime in on dress-up suggestions. What costume can this runner where for Halloween? What costume are you running in?